Read the full whitepaper here: www.emkablog.co.uk/hvacpanelhardware. The global HVAC industry is rapidly changing with a trend to natural refrigeration systems, although these still need controls and compartments. Such systems match the needs of a growing building industry worldwide including stores and offices with a parallel demand for large HVAC installations. This, together with constant upgrading of old systems with more efficient, lower energy equipment, means that the specialist hardware for HVAC packages is in increasing demand. 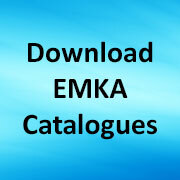 EMKA therefore manufacturers a continually expanding range of products for the HVAC industry and much of the range is modular, thus offering the designer and end user many options. This covers products that meet the relevant European standards such as: DIN EN 1886 and VDI 6022. Traditionally HVAC cabinets have had a unique combination of requirements which call for a specialist mix of hardware accessories. From the beginning we at EMKA have sought to meet the needs of the HVAC industry – a process which has culminated in availability of a complete program dealing with thick doors, IP65 sealing, personal safety (inner door handles etc. ), large handles (for gloved hands), corrosion-resistance, heavy door weights, external viewing requirement, multi-level access (e.g. padlocking), inset handles, compression locking, pressure relief prior to opening, corner frame pieces, lifting lugs and much more. For EMKA this has culminated in a very special package of panel hardware – in fact “everything but the enclosure” for the HVAC panel builder. Designed for HVAC installations to meet the needs and regulations of HVAC enclosures and cabinets. This includes thick insulated doors and panels requiring plastic handles to give a more comfortable grip, and plastic components to eliminate thermal bridging from one side to the other. Large operating elements such as handles allow for thick gloves and safety features are needed, such as the ability to open doors from inside. The extensive range derived from these requirements features long bodies for ¼ turn locks as well as traditional T and L compression handles with full 6mm gasket pull down facility. 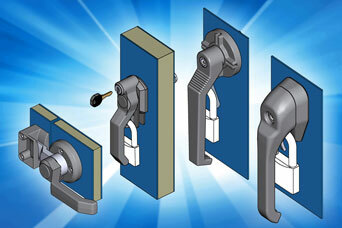 Where complete panel removal is required then a bridge clamp system is offered, along with lifting handles. Heavy duty and adjustable hinges facilitate door fitment – while frame components include corner pieces and heavy duty lifting/transport lugs. In particular we have recently launched an innovative new compression locking hinge for HVAC installations which provides HVAC manufacturers with a full multi-function hinge/latch/lock for securing of big air conditioning units and similar. It provides door adjustment for correct sealing, 5mm gasket pull down with pressure relief and the ability to be used as both door lock and hinge. Share the post "Specialist enclosure locks, handles, hinges and gasket for HVAC panels"